Keep your pup protected from wet weather with the Dog Raincoat Body Wrap by Doggie Design in Pink and Lavender. The new Dog Raincoat Body Wraps by Doggie Design are fashioned from the same pattern as their popular Alpine Coat style! 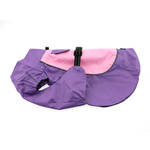 With a simple slip over the head and an adjustable strap and buckle clasp around the back, these raincoats are easy to fit on dogs of all sizes! The bright colors are perfect for those Spring rain showers! They are waterproof both inside and out and with the coverage on both the top and bottom of your dog to help keep your dog dry! 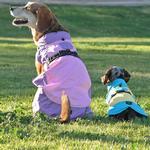 Dog Raincoat Body Wrap by Doggie Design - Pink and Lavender Customer Photos - Send us your photo! I love this raincoat. It’s so easy to put on and it keeps my sweet girl dry. Posted On 03/11/19 by Kimberleigh E from Northville, MI Yes, Kimberleigh E recommends this product! This coat’s design is the best I’ve ever seen for a raincoat! It’s rear leg elastic straps ensure the back of the coat stays down & wrapped underneath your dog for excellent water proofing!! ?? it & my baby-girl will too!! Two size charts are shown on the website page and they differ in dimensions, but luckily the chart on the left proved to be accurate and fits my dog well. The colors are pretty and we look forward to trying it on rainy days. Love everything we have purchased and will continue to purchase from Baxter Boo!